INDIANAPOLIS (AP) -- Top-seeded Andy Roddick and defending champion James Blake took different paths to the second round of the Indianapolis Tennis Championships on Tuesday night. Roddick needed just 63 minutes to oust Alex Kuznetsov, 6-4, 6-0. The No. 2 seed Blake, who defeated Roddick in last year's final, beat Swedish veteran Thomas Johansson 7-5, 7-6 (9) in a match that lasted 1 hour, 42 minutes. Blake got in only 59 percent of first serves, but lost only eight points when he did. He also recorded 13 aces. Roddick brought his record on the hardcourts of the Indianapolis Tennis Center to 17-2 with a dominant performance in which he never faced a break point. "I actually don't think I served that well,'' said Roddick, who had a first-serve percentage of 52 percent (22-of-42), but won 86 percent of those he put in play. The two-time Indianapolis champion had eight aces and no double faults. The first Blake-Johansson set had just one break of serve. Blake took a 6-5 advantage by recording the break in a game that lasted 16 points. He then won the set by holding at love. Johansson was broken in the first game of the second set and later took a 5-4 advantage by winning three consecutive games. Blake held serve twice to tie the set, after saving set point at 5-6 and 8-9, he closed it out. "I was playing real confident. When you're playing real confident, you go for the shots and it worked out,'' said Blake, who arrived Monday after losing in the final at Los Angeles. No. 5 Ivo Karlovic advanced to the second round by beating Brazil's Andrew Sa, and Korean Hyung-Taik Lee, the No. 6 seed, eliminated Junior Wimbledon champion	Donald Young, 6-2, 6-4. In earlier matches, No. 3 seed Dmitry Tursunov and No. 4 Mardy Fish moved on to the second round. Roddick and Kuznetsov each held serve through the first four games of their opening set. Roddick recorded the only break following two double faults by Kuznetsov. He then closed out the set by losing only three points on his next three service games, winning the final one at love with the help of two aces. Roddick broke Kuznetsov in the opening game of the second set and dropped only three points on his serve before ending the 23-minute set. "I was playing clean tennis. I wasn't giving away points. He was having to force the issue and I think that caught up with him,'' said Roddick, who will play Evgeny Korolev in the second round. Fish overcame a pair of 2-5 deficits to eliminate fellow American Vincent Spadea 2-6, 7-5, 7-5 despite getting in only 47 percent of his first serves. He helped himself with 10 aces, including four in the final set. Tursunov of Russia survived shaky serving to defeat American Michael Russell 6-3, 7-5. Also advancing was Paul Goldstein, who ousted Robert Kendrick 6-4, 6-4 in a matchup of Americans. 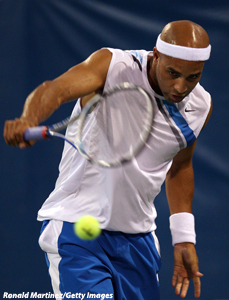 Other early winners included Russians Teimuraz Gabashvili and Igor Kunitsyn. Gabashvili eliminated local favorite Rajeev Ram of nearby Carmel, 7-5, 3-6, 6-4. Kunitsyn defeated Santiago Giraldo of Columbia, 6-2, 1-6, 7-5.